Model J Sterling currency Comptometer. The machine can be used in decimal mode by ignoring the three rightmost columns of keys. The full-keyboard Sterling Comptometer illustrated was made by the Felt & Tarrant Manufacturing Co. in the USA in the 1920s or 30s. It is a model J, serial number J331518. 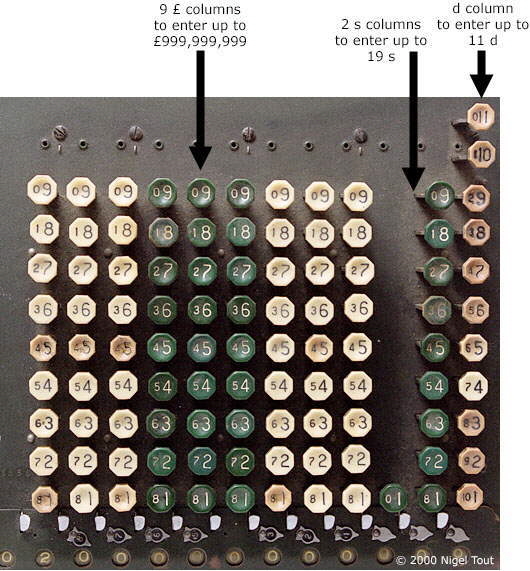 Standard decimal Comptometers have all columns identical with 9 keys in each (no key is required for 0). The maximum value that can be calculated is 9,999,999,999 Pounds, 19 Shillings, and 11 Pence (ie. £9,999,999,999/19s/11d). The 2 extra keys required in the Pence column would have caused problems for manufacture on a standard production line. The larger one is used for addition. The smaller one is used for subtraction using the "9's complement" method (or in the case of the d column "12's complement"). The machine pictured on the left is also a model J, serial number 297617. It only has 10 keys in the pence column (to enter 10 or 11 you have to press one key then another which add up to the required value. It has later model style, thick keys. It has a later model style "Comptometer" badge at the rear of the keys, rather than the usual "Felt and Tarrant" badge. Note that these Sterling currency machines can be used for normal decimal calculations by ignoring the rightmost three columns. The Comptometer was the first succesfull key driven adding and calculating machine. "Key driven" means that just pressing the keys adds the numbers entered to the total - no other action is required - so it is very quick for adding long lists of numbers. It was invented by the American Dorr E. Felt in 1884, and produced by the Felt & Tarrant Manufacturing Company. The Comptometer's basic function is addition. There is a column of keys (in general 1-9) for each decade. When a key is pressed, that number is added to that decade, with carry to the next higher decade, if applicable. Pulling the handle forwards clears the total to zero. Subtraction, multiplication, and division are also possible on Comptometers using special techniques. "Comptometer" eventually became to be used as a generic name for calculators of this type from all manufacturers. 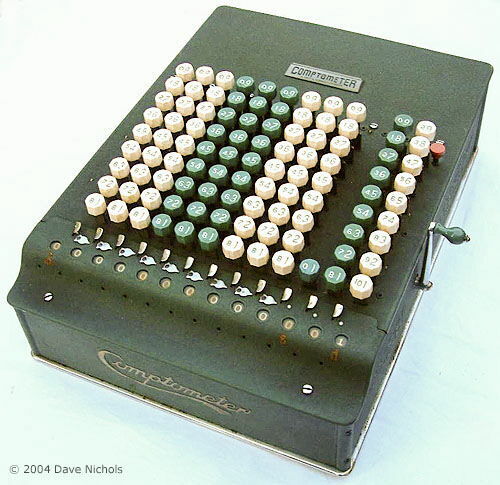 Comptometers were used into the late 1970s and were ousted by advances in the use of computers for accounting rather than the development of electronic calculators.